For the months of August through December 2018, I had the opportunity to work with the archival staff of the Program of Aegean Scripts and Prehistory on a large collection of miscellaneous letters found among the various personal effects of Emmett Bennett, Jr. The collection, which consists of nearly 300 letters, cards, and notes, includes serious academic debates, gentle advice for hopeful scholars, personal letters, and the ever-present bureaucratic correspondence that now is taken care of with e-mails. Working under the direction of the PASP Archivist Garrett Bruner, I learned about the international standards for archival procedures and labeling. Drawing from my previous archival experiences at my undergraduate institution, I eagerly jumped into the process of sorting, naming, scanning, and tracking down missing information about each letter. By the end of the semester, we had just reached the metadata entry phase of the project, and collectively Bruner and I have been tackling this monumental task. In addition to my work on the Bennett Correspondence project, I helped translate and enter the metadata for a series of letters written in French by the scholar Jean Pierre Olivier, a close associate of Bennett’s and his co-author of The Pylos Tablets Transcribed (usually shortened to PTT in their extensive correspondence). I also worked for the Pylos Tablet RTI project under the direction of Kevin Pluta and Cassandra Donnelly. The RTI project involved transforming a series of captured photographs into a texture-based digital facsimile. My interest in the RTI work led me to participate in the Multi-Spectral RTI Workshop hosted by the University of Texas at Austin; I brought a cast of the archaic Cypro-Minoan tablet from Enkomi (housed at PASP) to the workshop to create the first digital facsimile of the object using their equipment. 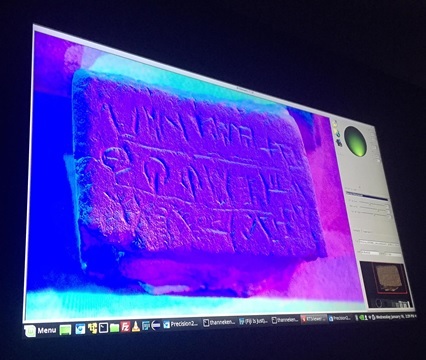 Using the images that the team generated, we learned how to use multi- spectral RTI software to create facsimiles for academics all over the world using different forms of light analysis to reveal subtle textural and color changes in the surface of objects. My time working at PASP was marked by wonderful learning experiences. Professor Palaima kindly gave me the tools I needed to begin learning Linear B; Garrett Bruner happily taught me how to do basic conservation of delicate paper materials; Cassandra Donnelly was a constant source of invaluable information regarding the history of Linear B scholarship. On more than one occasion Bruner, Donnelly, and I worked together as a team to decipher scrawling handwriting, identify scholars and friends mentioned in the letters, and share exciting discoveries we had made in perusing them. One of my favorite moments was discovering a letter (HMtoELB19651115 – the upload to Texas ScholarWorks is pending) from Hugo Mühlestein, a Swiss scholar , to Bennett. 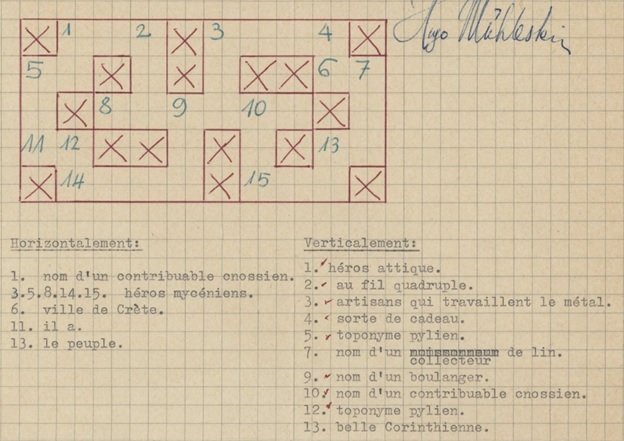 Mühlestein created his own “Mycenaean crossword,” the clues written in French and the answers actually written in Linear B, which he sent to Bennett (along with the key) “puisqu’il est permis de rire.” Hopefully Mühlestein’s work will continue to provide amusement for the Linear B scholars among us willing to take a stab at the crossword — the solution key will be uploaded to Texas ScholarWorks along with the letter. Bennett also kept the sheet of paper upon which he tried to work out Mühlestein’s Linear B crossword. Professor Palaima recalls Bennett doing the New York Times crosswords with a ballpoint pen in about a half hour, sometimes less. The novelty of a Mycenaean crossword, carefully drawn out by hand, clues thoughtfully laid out and typed, Bennett’s own worksheet included, is a symptom of the most striking thing about Bennett’s personal correspondence — the human side to academia. Excluding the bureaucratic correspondence, emotion bubbles up in almost every letter, whether it is fighting over Linear B theories with other scholars or a heartfelt letter from across the country (or globe!) to Bennett from his former students, scholarly admirers, colleagues, and friends. Many of the letters I worked with were from his students who had gone on to pursue careers outside of Classics. They still took the time to thank Bennett years after the fact for his kindness and his careful instruction. Still more were filled with the little human foibles that mark daily life: the spelling mistakes, the little doodles, the dreams, the rejections, the papers that seem to get lost when we need them and show up right when we no longer want them. On one memorable occasion, Olivier sheepishly writes to Bennett to tell him he found his manuscript notes concerning The Pylos Tablets Transcribed under a loaf of bread (letter JPOtoELB19681009). For a graduate student just stepping into the world of academia, it is comforting to see “the greats” like John Chadwick, Colin Renfrew, and Bennett himself fall into the same little traps that we all find ourselves in. But the importance of this, I think, goes even further than the implications that our heroes are people too. Our heroes are people who work together to achieve great things. Of course they are bright and capable people in their own right, but it is through collaborative work that we agree or disagree often, learn more, produce our best content, and have the most impact on the lives and work of others. Working with Bennett’s correspondence is a pleasant reminder of the very real role we play in each others’ lives inside and outside of the academic world. This is a truly important ‘something’ that frequently slips our minds as we think about funding, deadlines, conferences, and grading. My time in PASP, living amongst the remnants of Bennett’s letters and his lasting influence, has made me more appreciative of the long tradition of collaboration and the strong sense of community within the field of Classics. Perhaps more importantly, it helps me keep our reality in perspective: that we are humans first, academics second, and that missing paperwork is probably hidden under a loaf of bread. 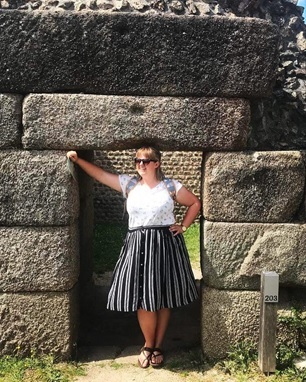 Zoé Elise Thomas is a first-year Classical Archaeology track PhD student in the Department of Classics of the University of Texas at Austin. Her research interests lie in identity studies, domestic architecture, bioarchaeology, digital humanities, and finding the best cat cafe.